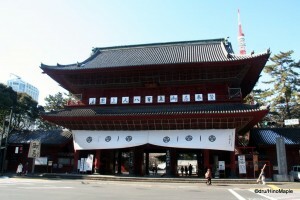 Daimon is an area that is fairly unknown to a majority of tourists in Tokyo. It is better known as Hamamatsucho or even Shiba. Being Tokyo, many neighbourhoods are so close to each other that it can be difficult to distinguish between the different areas. This is one such area. Stretching from the east side of Hamamatsucho Station all the way to Tokyo Tower, the Daimon area is not the most entertaining areas but one of the secret gems of Tokyo. For those with little time, there is no real reason to visit, to be completely honest, but if you have the time, you will be rewarded with beauty and tranquility that is not found outside of the area. Daimon itself is a very bland area. It is a modern symbol of how most of Japan’s cities look. It has the appearance of being a small city in Japan with rows of boring rectangular buildings. In all directions you look, you will find it difficult to tell where you are unless you can see Tokyo Tower. Adding to the blandness is the fact that the area around Hamamatsucho is very busy transfer point as it is the end station of the Tokyo Monorail which runs to Haneda Airport. The east side of Hamamatsucho is the home of the Kyu Shiba Rikyu Gardens but unfortunately I haven’t visited that area yet but I hope to do so in the near future. The garden is considered the most beautiful in Tokyo and must be worth a visit. I often just head straight from Hamamatsucho Station to Zojoji which is just a few minutes on foot. Zojoji is a very beautiful Buddhist temple located near the foot of Tokyo Tower. 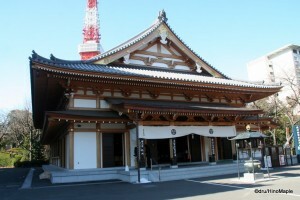 It is a large complex that houses one of the most tranquil temples in Tokyo. I have visited many temples and shrines but Zojoji is one of the few inviting temples that encourage people to go inside and pray. In some temples and shrines, the prayer area can feel a bit strange as the doors may be closed, or the setting can feel a little less inviting. It is worth the time to just sit down and soak up the atmosphere inside the temple itself. It is a very quiet atmosphere where you can only hear the various prayers people make as they throw their money into the collection boxes. As I mentioned in a previous post about the best temples and shrines in Tokyo, Zojoji is one of the most picturesque. 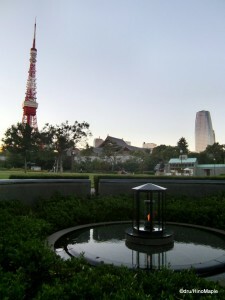 With Tokyo Tower in the background, you can really get a good sense of history and modernity. The surrounding grounds are also interesting with a small hall adjacent to the main one. Behind the small hall is a mausoleum for some of the members of the Tokugawa shogunate, one of the first shogun clans to rule Japan. They are revered in Tokyo and I would say one of the most, if not the most important clan in Japanese history. Unfortunately you do have to pay a small fee to enter the mausoleum grounds itself. To the south of Zojoji is Shiba Park. It is not a very popular park and very often overlooked by most people. 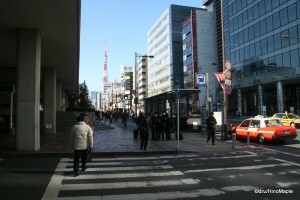 Most tourists will cut through Zojoji to head directly to Tokyo Tower. I prefer a small stop in Shiba Park as it is somewhat of a unique park in Tokyo. The entrance makes the park look like a very small park. It is an open field with trees in the back. What is hidden is a large mound with stairs heading up the mound at the back of the open field. Few people, aside from the locals visit this area. It is a wonderfully quiet area with mostly local tourists exploring the area. There are a few monuments in the area but for those longing for some nature, specifically a forest like feeling, this area is perfect. With trees blanketing the entire hill, you will be hard pressed to find a lot of natural sunlight as the trees filter out most of the sunlight. There are a lot of interesting corners of the park that can be explored. It won’t take a long time to explore the entire park but it is worth it if you have the time. Flanking Zojoji are two hotels. 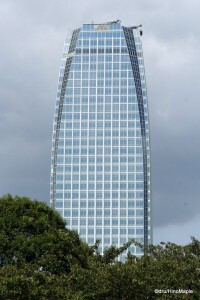 The Prince Park Tower is located to the south of Zojoji on the west side of Shiba Park. It is a tall modern tower that is a nice hotel to stay in, albeit somewhat less convenient than many other hotels. There is a small open field located next to the hotel that is a nice way to cut through to Tokyo Tower rather than going through the main route next to Zojoji. On the north side of Zojoji is the Tokyo Prince Hotel. This is one of the most written about hotels in Tokyo. Various novels that are set in Tokyo often use the Tokyo Prince Hotel as one of their locations. While it is often referred to in various novels, it is also well known for its swimming pool. In the summer, the pool is open to the public for a fee and it is one of the most popular swimming pools in the city. This is mainly due to the good views of Tokyo Tower next to the hotel itself. Unfortunately, for a regular tourist, this is probably not an important place to visit and the building itself is architecturally boring. The area itself is more important than the hotel but for the curious, there is no harm visiting the hotel itself. 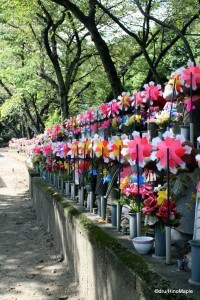 Aside from Zojoji and being a way to access Tokyo Tower, Daimon is not really an important place for tourists to visit. I feel that it is a very nice hidden gem in the city and worth a visit for Zojoji alone. It doesn’t take a long time and you can easily visit Tokyo Tower at the same time. Combining it with an afternoon trip to Roppongi can help as well, and Tokyo Tower is pretty well connected to other areas of Tokyo via the Tokyo Metro System. It can be difficult to choose but if time is on your side, make plans to visit the Daimon area. This entry was posted in Tokyo and tagged Chuo-ku, daimon, Hamamatsucho, Haneda Airport, japan, Kyu Shiba Rikyu Gardens, Minato-ku, Prince Hotel, Prince Park Tower, Shiba, Shiba Koen, Shiba Park, The Prince Park Tower, Tokugawa, tokyo, Tokyo Monorail, Tokyo Prince Hotel, Tokyo Tower, zojoji by Dru. Bookmark the permalink.